Paris -Real Madrid have reportedly reached a world record deal in principle to sign Kylian Mbappe from Monaco for €180 million, closing one of the hottest transfer sagas of the summer. Spanish sports daily Marca, citing sources close to the negotiations, said the gifted teenage striker who shot to stardom last season is expected to join Real "in the next few days" on a six-year deal. French newspapers Le Parisien and Nice Matin were quick to announce that Monaco had denied the report. But in the cloak and dagger climate of rumour and innuendo that characterises football's transfer operations, the latest twist revived speculation surrounding the future of Europe's most-eligible young star. Only the rumour mill surrounding Neymar and the massive sums involved have come close to eclipsing the buzz generated by Mbappe in recent weeks. Neymar, Barcelona's 25-year-old Brazilian superstar, is at the centre of frenzied speculation linking him to Paris Saint-Germain for a world record €222 million, the price of his buyout clause. The likelihood of that deal looks to have receded in the past few days as the Mbappe move takes centre stage. And if it goes through, Real will have completed a major coup by snatching one of the most coveted young players in football from under the noses of top European clubs including PSG and Premier League giants including Manchester City. Real midfielder Casemiro, on tour with the European champions in United States, refused to be drawn on the speculation ahead of Wednesday's friendly clash against Manchester City in Los Angeles. "Mbappe is not a Real Madrid player so I can't speak about him," said Casemiro. But Marca, known to have strong links to the Madrid club, insisted that Real are set to pay between €150-160m with add-ons of between €20m and €30m for Mbappe, dwarfing the current world transfer record of €105m Manchester United paid to lure Paul Pogba from Juventus last year. Real are looking to fill the void left by Alvaro Morata, who joined Premier League champions Chelsea last Friday in a deal reported to be worth up to €80 million. Madrid coach Zinedine Zidane, asked about Mbappe last week, said that Real were short one attacker after Morata's departure but chose his words carefully. "I am not saying we are lacking a centre forward but we are short of one attacker, that's how things are," he said. "We will see how we will manage that." If he does arrive at Zidane's European champions the 18-year-old will be on a net annual salary of "€7 million", Marca said. Mbappe, under contract at Monaco until 2019, has been wooed so hard by some of Europe's top clubs that Monaco raised the red card and warned the circling predators that they could be reported to FIFA, world football's governing body. 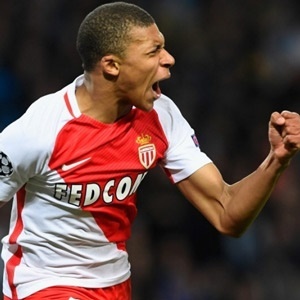 "Top European football clubs made contact with Kylian Mbappe and his entourage without our authorisation," Monaco said on their website. The club said they wanted to remind these clubs that such actions are contrary to French and international regulations. Mbappe scored six goals in six Champions League starts and 15 in Ligue 1 as he exploded onto the scene in the second half of last season. On Monday, Monaco lost full-back Benjamin Mendy to Manchester City in a world record £52 million deal for a defender.